Valves are linear-elliptical with capitate apices. Axial area on raphe valve narrowly lanceolate; axial area on rapheless valve linear. Both valves lack a distinct central area. The raphe is straight. Striae on raphe valve are slightly radiate to parallel; each stria in the middle of the raphe valve consists of a transapically elongated areola. The striae on rapheless valve are slightly radiate to parallel; each stria consists of two transapically elongated areolae and the areolae are separated by a narrow longitudinal hyaline area on each side of the valve. The specimens illustrated here (from high elevation lakes in Wyoming) represent the first verified record of K. nitidiformis in the US. These specimens have striae that are more parallel than the slightly radiate striae illustrated in the iconotype. To date, K. nitidiformis has been verified from Holly Lake, Grand Teton National Park, Wyoming. 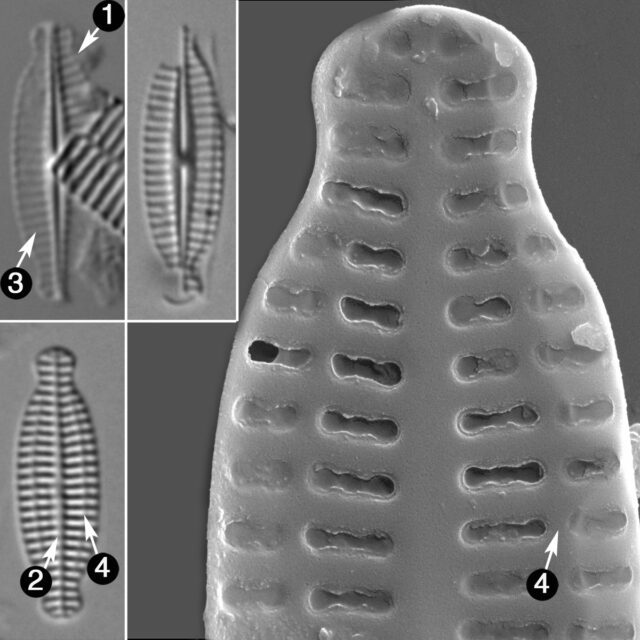 Several records at ANSP have been misidentified as K. nitidiformis, rather than K. amoena. 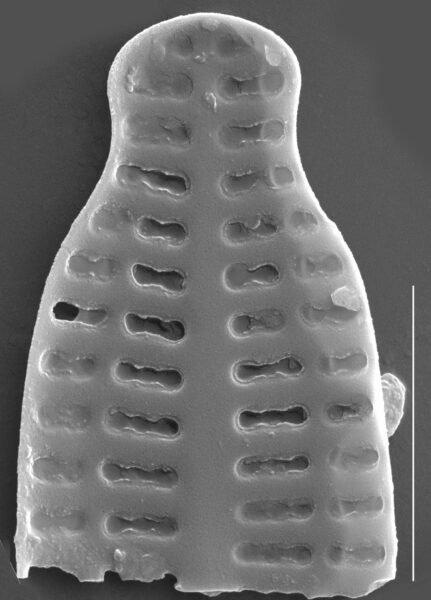 Valvae elliptico-lanceolatae apicibus protractis, capitatis, 12-18 μm longae, 4,5-5 μm latae. Raphovalva: Raphe recta filiformis, area axialis angustissima linearis, area centralis nulla. Striae transapicales radiantes, leviter in media parte et in finibus capitatis, magis sub apicibus, circiter 21/10 μm. Areovalva: Area axialis angustissima linearis sicut rapho-valva. Striae transapicales paulum aut modice radiantes, 21/10 μm, bilateraliter linea hyalina intermissae. 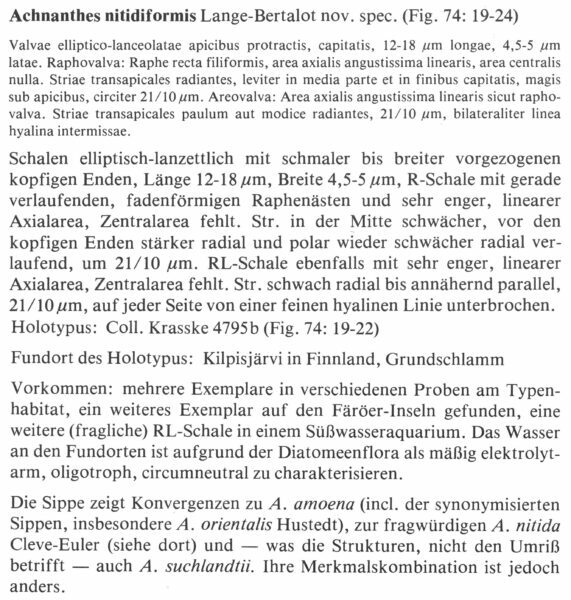 Vorkommen: mehrere Exemplare in verschiedenen Proben am Typen-habitat, ein weiteres Exemplar auf den Färöer-Inseln gefunden, eine weitere (fragliche) RL-Schale in einem Süβwasseraquarium. Das Wasser an den Fundorten ist aufgrund der Diatomeenflora als mäβig elektrolyt-arm, oligotroph, circumneutral zu charakterisieren. Die Sippe zeigt Konvergenzen zu A. amoena (incl. der synonymisierten Sippen, insbesondere A. orientalis Hustedt), zur fragwürdigen A. nitida Cleve-Euler (siehe dort) und — was die Strukturen, nicht den Umriβ betrifft — auch A. suchlandtii. Ihre Merkmalskombination ist jedoch anders.